Gardens are a great way to help lower your grocery bill, get you moving around for some physical exercise, and provide a sense of pride that, “Hey, I grew that!” It’s simply satisfying. And one way to ensure that a garden grows to its fullest potential is to fertilize it with a layer of composted dirt. Want to start a compost bin of your own? Here are some tips. 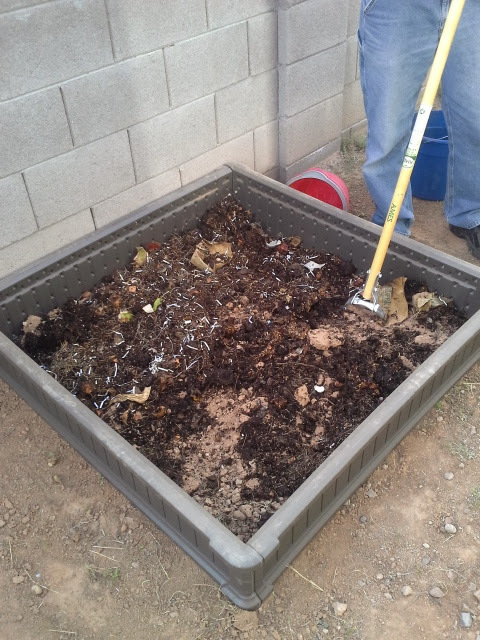 Compost being spread over dirt in a raised bed. It doesn’t hurt to mix organic dirt or organically produced livestock manure for a good base as you build the rest of your compost. And it’s helpful to have a nice balance of wet (veggies, plants) with dry (coffee grounds, paper) materials. Good luck, and enjoy your fresh dirt and future gardens!